Cover to Cover #392A: Jake Black, "The Official Ender Companion"
Discussion: Barry from England relates how well social networking sites have helped increase awareness and cross-promotion with other authors, and Mike and Mike talk about how social networks is shifting the traffic quality coming to view the author blogs and websites. 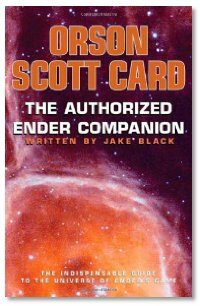 Interview: Jake Black, co-author of The Official Ender Companion, joins Mike and Mke to chat about the definitive encyclopedia of the Ender universe. Jake talks about his introduction to and immersion into the stories and characters of the "Ender's Game" universe, the process of making sure all of the facts and data were accurate and complete, and more. Jake also tells us about his upcoming comics, and other projects to look for later this year. Further to the charity event described in my call in, one of the writers in my blog circle has launched a new event to help people who have suffered in the Haiti earthquake, where she has pledged to donate $1 for every comment received until this Friday midnight EST. I heard Jake Black talking recently on an episode of Writing Excuses, where he goes into more detail about his route into the world of writing professionally for comics. It was great to hear him talk about this book in addition to this.